Ayaan Hirsi Ali Time article “Beware of Michiganistan”: What she doesn’t understand about American Muslims. But she doesn’t understand what it’s like to be one in America. In a recent opinion piece, activist and author Ayaan Hirsi Ali bares her bigotry with a breathtaking lack of awareness. Photo illustration by Slate. Photo by Mark Wilson/Getty Images. A version of this article originally appeared in Context, New America’s Medium publication. Update, May 4, 2015, 8:15 a.m.: Because of a production error, this article was originally published in truncated form. The entire text has been restored. If you have ever questioned the impunity and ease with which Muslims and Islam can be vilified in the United States, I would point you to Ayaan Hirsi Ali’s recent piece in Time, “Beware of Michiganistan.” The title itself caused me to gasp — but only a little, since Hirsi Ali’s anti-Muslim excesses are nothing new. Hirsi Ali is currently on the media circuit to promote her latest book, Heretic: Why Islam Needs a Reformation Now. 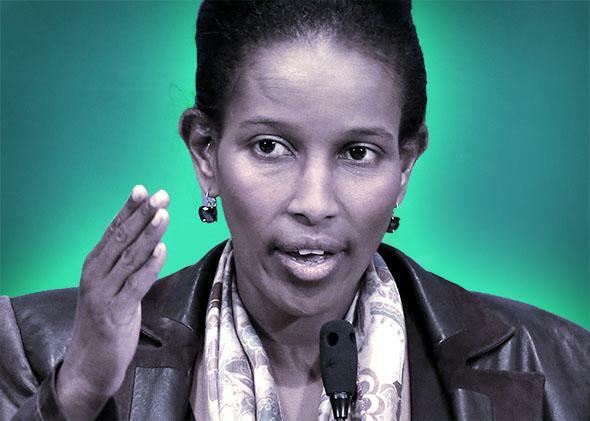 In this recent Time piece, Hirsi Ali bares her bigotry with a breathtaking lack of awareness. She argues that two-fifths of Muslim immigrants who come from “countries [that] hold views that most Americans would regard as extreme” must be feared, but, according to a recent study from the National Consortium for the Study of Terrorism and Response to Terrorism, such threats rank lower than “sovereign citizens” in the American consciousness. Even more troublingly, she asserts that a growing Muslim population in America must be perceived as a violent threat, period. She spends what reads to me like a distasteful amount of time discussing the birth rates, conversion rates, immigration rates, and the general demographic growth of Muslims, sounding as anxious and embarrassing as a Tea Partier talking about Latino populations and the decline of the “white era.” The media, especially the liberal media, would not ordinarily entertain such racist analyses, but she gets a pass as an ex-Muslim attacking Muslims. My response to Hirsi Ali’s fear-mongering use of these numbers — and other choice lines from her article, such as “only tiny fractions [of Muslims] would be comfortable if their daughters married Christians” — is simple. In a free-society country like the United States, people of all faiths are entitled to believe their scripture is the word of their God, prioritize their faith before their nationality, remain culturally distinct in their own practices or even geographically in their own neighborhoods, and prefer their children marry within the faith that they were raised in. Not only do people in the United States have this right, but communities of this nature are also common here. They go by many names: Hasidic Jews, Amish, Mormons, Evangelical Christians, and yes — sometimes even Muslims. In her article, Hirsi Ali seems particularly concerned about conversion rates of black Americans to Islam. She may not realize that 60 percent of births in American Muslim households are actually among black American Muslim households — making conversion practically a nonissue. And even were that not the case, the U.S. Constitution would still protect the right of conversion, along with freedom of speech and expression. Both as an immigrant and as a lawyer who represented immigrants for over a decade, what I find remarkable about Hirsi Ali’s comments is how obliviously she positions herself as an American concerned about the “attitudes” of Muslim immigrants. Having neglected elsewhere in her piece the significance of the black Muslim population — the majority of whom are anything but “new” Americans — she also harps on widespread fears of the impact of Muslim assimilation on American culture, even though studies show American Muslims are one of the most well “assimilated,” best educated, highest income religious minorities in America. Hirsi Ali, I fear, is plagued by European demons (by “demons,” I mean rampant anti-Muslim and anti-immigrant bigotry), without any sense of the American fabric, or even the American spirit. Which brings me to the real problem here: Hirsi Ali is actually the immigrant she fears — one who has failed to assimilate to the United States. In America, even fundamentalist speech is protected by the First Amendment—we don’t have thought or religious police here. As long as you’re not hurting anyone, you’re actually legally allowed to be as religiously strict as you please. You can dress in religious garments, eat religiously mandated foods, erect your own houses of worship and private schools, have as many babies as you think God wants you to have, proselytize to others, and expect your employers to accommodate your practices of belief. I have represented enough immigrants to know it takes time to accept and internalize the constitutional freedoms of the United States. It takes time to become comfortable with people who aren’t like you and it takes adjustment to tolerate an ethnically and religiously diverse and egalitarian society. Perhaps one day Hirsi Ali will get assimilated, and until she does, I wish the media would stop giving her a platform.